The thing about International Men's Day. Today is International Men’s Day. It’s an occasion to put the spotlight on the inequity men suffer. The structural oppression that holds men back. The invisibility of men in positions of power in business, politics and beyond. Their diminished access to education, decision-making and employment. The salary penalty men are subject to on account of being male. Of course, I jest. When it comes to gender, men are not the underdogs. They are the reigning champions, the minor and major premiers. In Australia, men hold 83% of CEO positions and more than two thirds of all parliamentary positions. Men comprise more than 50% of nearly every political Cabinet in the world, with the exception of Canada. 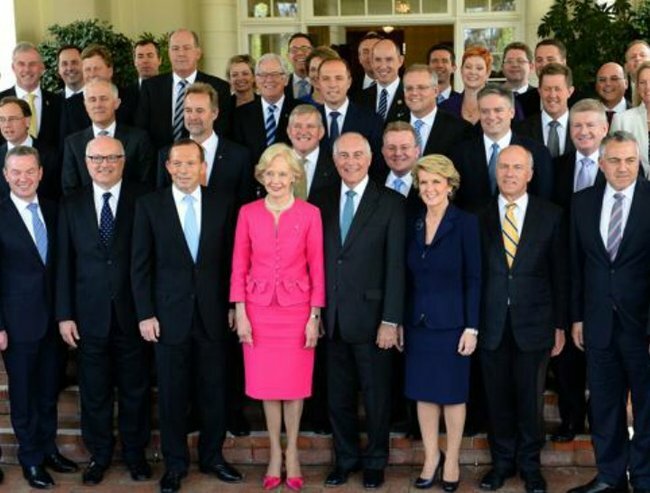 Until three months ago, Australia’s Cabinet had just two women out of 19 men. Unlike women, men need not wait another 118 years for parity in what they earn, as the World Economic Forum has reported today. Men have been earning more than women for time eternal. Men didn’t battle for the vote; it was given to them. Men don’t collectively struggle to have their “merit” recognised. They don’t bash their heads on glass ceilings. They don’t undertake the vast majority of unpaid work. There is barely a position of power that men haven’t ever occupied. Milestones like a man winning the Melbourne Cup for the first time in 155 years or having men as the Prime Minister and the Governor-General don’t make history or represent a major triumph. There is not a single country in the world when men and women are deemed to be treated equally. So, yes, in many ways International Men’s Day feels crazy to celebrate. NSW Greens MP Mehreen Faruqi hit the nail on the head with her Facebook post earlier today. Apparently today is International Men’s Day. That’s weird, I thought every day is Men’s Day? 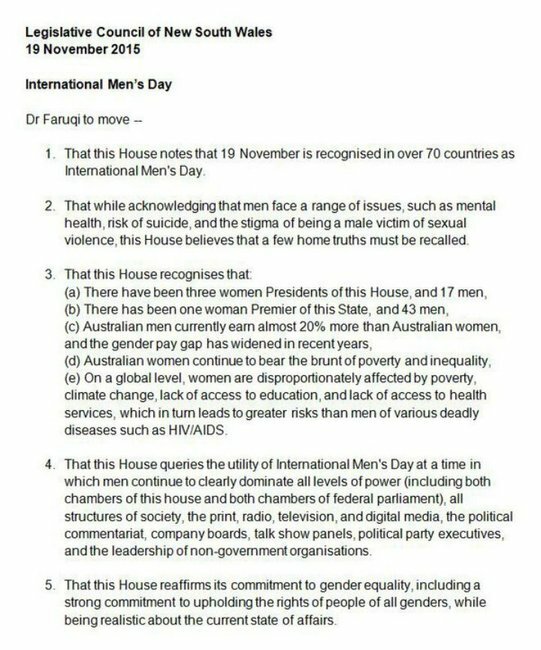 She also introduced a motion in the NSW House of Representatives asking if International Men’s Day requires celebrating. Young men face enormous challenges, mental health and suicide are chief among them. All the privileges attached to being male, don’t negate the fact that masculinity and its associated stereotypes are complex for men to navigate. I completely agree with the Movember Foundation CEO Adam Garone that the health gap that men suffer needs to be considered and explored. Improving men’s health and wellbeing is a win/win for individual men and their families. But, it’s folly to suggest men are not caught in a real and ongoing battle for equality that needs to be recognised on International Men’s Day. International Women’s Day does not exist merely to celebrate women’s achievements or reminisce about the brave women who fought for the rights and privileges some women enjoy today. IWD exists because gender equality remains the ideal not the reality. Around the world, women remain oppressed and discriminated against to various degrees. Until that battle is won, International Men’s Day is unlikely to draw much applause.